Ventilation is a set of actions and techniques used to arrange air exchange and to provide a specific air medium condition in the premises and in working places. Ventilation maintains desirable indoor climatic parameters in compliance with set hygienic norms and technology requirements. What is Ventilation Required For? We are surrounded with air and breathe in and out 20 000 litres of air every day. How much healthy is the air we breath in? There is a range of aspects to determine air quality. Oxygen and carbon dioxide concentration in the air. Oxygen decrease and carbon dioxide cause stuffiness in the premises. Content of harmful substances and dust in the air. High content of dust, tobacco smoke and other substances in the air are harmful for the human organism and can cause various lung and skin diseases. Odours. Bad smell causes discomfort and irritates. Air humidity. Too high or low humidity makes us feel uncomfortable and even may provoke acute disease attacks for sick people. Air humidity is important also for inner climate. For instance, doors, window frames, furniture may shrink because of too low humidity in winter and get swollen in humid environments, e.g. in swimming-pools, bathrooms. Air temperature. The comfortable indoor temperature is within 21-23 °C. Higher or lower temperatures influence physical and mental activity and health condition. Air motion. Increased air motion in the premises causes drafts and low air motion causes air blanketing. Any of these factors influence our well-being. Properly arranged ventilation system is the only solution in this situation. It provides supply of filtered air in summer and supply of filtered and warmed up air in winter as well as extract stale air removal from the premises. Any ventilation system must include synchronous fresh air supply and extract air exhaust thus ensuring the ideal air balance in the room. In case of poor or unsufficient air intake from outside the oxygen content decreases, humidity and dustiness level increase. If exhaust ventilation is not provided or it is not efficient, polluted air, smells, humidity and harmful substances are not removed. 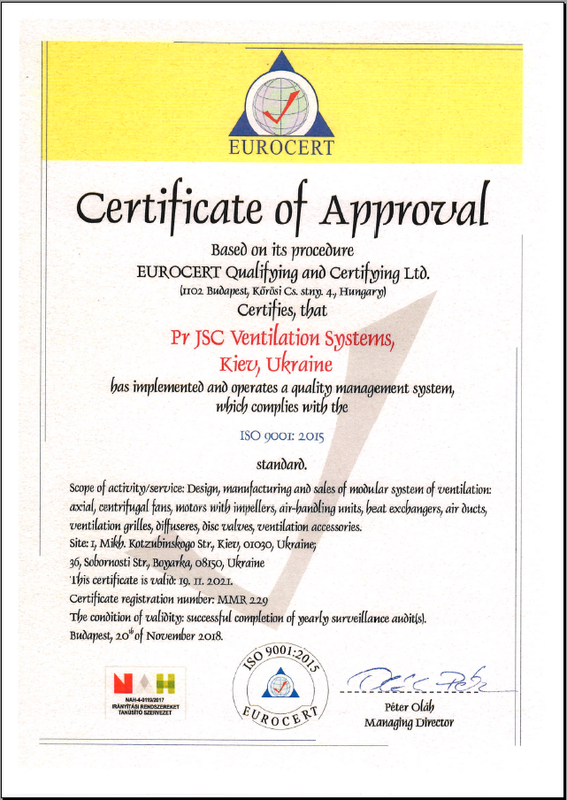 One more important factor for properly arranged ventilation system is joint operation of supply and exhaust air vents. If indoor ventilation is provided by air exhaust only, e.g. by an extract bathroom fan, the only possible air supply source is the gaps in windows, doors and construction elements. This uncontrollable air supply results in dust ingress, smells and draughts. Ventilation grilles in the bathroom doors, wall or window vents, open windows are the only natural supply air sources that may compensate for air extraction. However mechanical ventilation is the only solution to provide central air supply in the rooms.